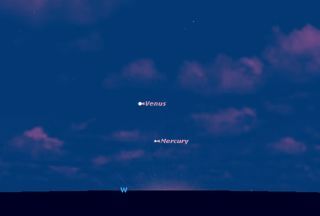 SKY MAP: Venus and Mercury just after sunset on March 26, 2010 from mid-nothern latitudes. The two planets will appear closer together and higher in the sky on subsequent evenings. A Pasde Deux is French for"Step of Two" and is what partnering is called in ballet. By dancingwith a partner the lady can jump higher, and "float" about the stageas she is carried by her male partner. And from now through mid April, acelestial Pas de Deux will be enacted in the western evening twilight sky asthe "Queen of the Night," the brilliant planet Venus, will engage thenormally hard-to-find planet Mercury. Through arun that will last more than two weeks, skywatchers will be able to watch asVenus seemingly "floats" above and to the left of Mercury. The twoplanets will gradually draw together, then slowly they will separate, Mercuryultimately fading from view. It should be a fantastic sight if skies are clear and you know where to look. IsaacAsimov (1920-1992), a writer of science and science fiction, once commentedthat the planetMercury is rarely visible when it is truly dark.? ?I suspect,in fact,? he wrote, ?that many people today (when the horizon is generally muchdirtier and the sky much hazier with the glare of artificial light than it wasin centuries past) have never seen Mercury.?? Mercury isindeed clever at escaping detection. It is said that the famous astronomerCopernicus never saw this planet from his native Poland ? more than likely anapocryphal tale. You can find it, though.? It?s all in knowing how.? Theclosest planet to the Sun, it is usually masked by the Sun?s glare, so one alwaysmust look for Mercury either soon after sunset, or just before sunrise. On theevening of Friday, March 26, about a half hour after sunset, using binoculars,scan near to the west-northwest horizon to locate Mercury.? Although shiningat magnitude ? 1.3, which is virtually as bright as Sirius (the brightest starin the sky), Mercury is still deeply immersed in the bright evening twilight soit will be rather difficult to pick out. But this unfavorablecircumstance will rapidly change in the coming days, for although it willslowly fade, this will be more than compensated by the fact that it will bepulling farther away from the sun and correspondingly lifting higher up intothe sky. Also take note how Mercury will appear to approach Venus,moving up toward it from Venus? lower right. In fact,between March 28 and April 12, Mercury will be within 5-degrees of Venus (yourclenched fist held at arm's length measures approximately 10-degrees).? So Venuswill serve as a convenient guidepost to locate this normally hard-to-findplanet. About 30 to 45 minutes after sunrise look low toward the west-northwesthorizon. You will immediately spot brilliant Venus. Hovering below and to itsright you will see a bright yellowish ?star.?? You?re looking at our solarsystem?s so-called ?elusive? planet. In fact,this will be Mercury's very best showing of the year for those who are locatednorth of the equator?better than even this year's best pre-sunrise apparition(which will occur in late September). And since also more people are interestedin looking for Mercury in the dusk than in the dawn, the dusks of late Marchthrough the first half of April are the ones to plan on. On the evening of April 3, Venus and Mercury will appear closesttogether, just a little over 3-degrees apart. Though it will be shiningbrilliantly at a magnitude of -0.6, Mercury still appears only 1/21 as brightas Venus, which literally dazzles at magnitude -3.9. Thereafter, the twoplanets will very slowly separate. Interestingly, this is not a conjunction between these twoplanets?at least in the "official" sense. At no time do Mercuryand Venus have the same right ascension or ecliptic longitude. But thefamed Belgian calculator, Jean Meeus calls this a "quasi-conjunction"(when two objects coming to less than 5-degrees apart without having a trueconjunction). In the ?2010 Astronomical Calendar,? Fred Schaaf notes that thisis the "first quasi-conjunction of bright planets since 2006 and it lastsa number of days." From our Earthly vantage point, Mercury will be sweepingaround in its orbit, eventually taking it between us and the sun. So its phasewill be waning, going from gibbous, to half illuminated, to a crescent. And asits disk becomes less illuminated, it will correspondingly fade in brightness. Indeed on April 8, Mercury will appear only half as brightas it appeared five days ago while arriving at its greatest elongation, just19-degrees east of the Sun. But for those situated at north-temperate latitudesthese early-spring elongations are when, during evening twilight, Mercuryappears to stand almost directly over that point on the west-northwest horizonwhere the sun has set. So this is when it shines highest during dusk. After thisevening, Mercury will start descending into the twilight glow, while fadingdramatically [photosof Mercury]. I'm guessing that the evening of April 15 will probably bethe last chance for most people to get a glimpse of Mercury. Half an hour aftersunset, concentrate about 10-degrees (about "one-fist") above thewest-northwest horizon. Binoculars will be a big help. First, scan for ahairline crescent moon, only about 36-hours past new phase. About 1-degreebelow and to the left of the moon will be Mercury, having faded to magnitude+1.5. By the next night, Mercury will have vanished into thesunset fires and the dance will have ended.